After having started up their activity in the boat nautical sector at the beginning of the Seventies, the Permare Group has expanded its field of action range of activities, going from supplying qualified services for pleasure cruising to the construction of top-level boats. 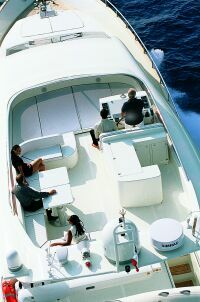 During the eighties and nineties, Permare produced thirty 16 metre boats and 20 ranging from 19 to 25 metres, proving that from the start start bethe Group has focussed its attention on important boats, characterised by a considerably stylish elegance and indisputable quality, dedicated to demanding owners, able to appreciate exclusive boats. This solid base has given birth to the Amer 86: from an external layout studied by Profilo Design and with interiors designed by the boatyard, Andrea Bacigalupo has realised an absolutely new mould under every aspect, from its bottom, to its deck and superstructures, using vinyl-ester resins subjected to with a a special anti-osmosis treatment, able to guarantee a finished product of very high quality and, in theory, unlimited durability. All this on a soft, stable bottom that is safe at all speeds and in any sea/weather conditions. 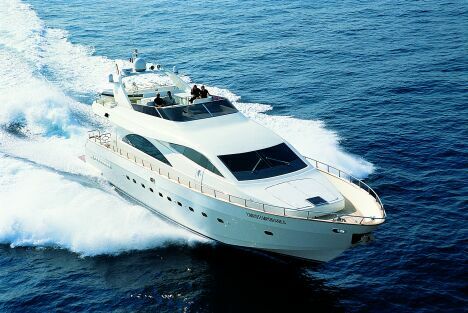 Studies of the quick work on the Amer 86 did not aim to produce exaggerated performances, so much so thatand in fact its bottom has been designed to reach maximum speeds of around 30 knots, but it aimed to guarantee the maximum in terms of safety, comfort and elegance, without forgetting that privacy indispensable for ensuring top level cruising. But let's take a look at the details, at how this magnificent boat is structured, starting from its her enormous flying bridge, with starboard wheelhouse equipped with comfortable pilot and co-pilot seats, and large dinette to port, for al fresco open-air dining or simply for an aperitif during sailing or on berthing. The roll bar has room for the radar, GPS and TV aerials, while the tender is stored astern, with an easy to use mini-crane. Going down to the main deck we find a spacious cockpit, this too furnished with table, sofa and chairs, from which it is possible to go down two stairways located to the sides, towards the large bridge astern, or along two comfortable and well-protected side gangways, to reach the sundeck in the bowsbow , for peaceful moments of relaxation in the fresh air. 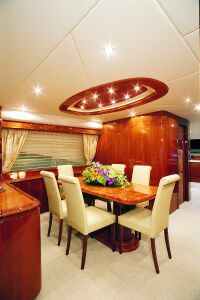 From the cockpit, a large glass door leads into the heart of the boat, its her elegant saloon. 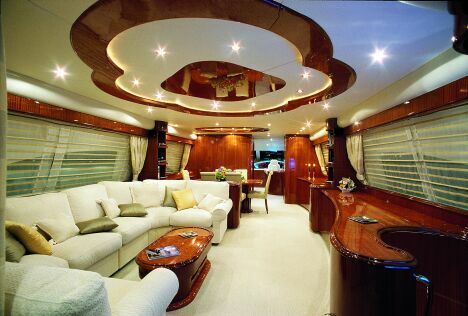 To the left a large dinette and after that the dining area, separate galley and another dinette located alongside the futuristic internal navigating bridge, in a slightly raised position. To starboard a refined low unit piece of furniture, housing complete with a 42" plasma TV, runs along the entire wall to the service bathroom. At the end of this unit piece of furniture, towards the entrance glass door, there is a staircase leading to the owner's cabin. 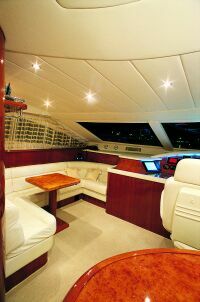 Located just over halfway along the boat towards the stern, this extremely large cabin that fills the full beam of the boat, is equipped with all necessary comforts and has a fridgeminibar, 15" plasma TV and safe. At the other end of theunit piece of furnunit, after the bathroom and behind the bridge, another stairway leads to the VIP cabin and the two guest cabins. 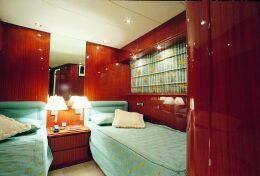 The VIP cabin, located from the middle of the boat towards the bowsbow, is full beam like the owner's cabin and has no reason to envy the latter for spaciousness and fittings with, obviously, its own bathroom and separate shower cubicle. 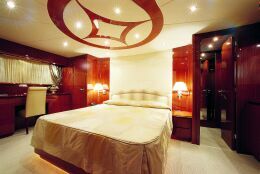 The two guest cabins amidships are perfectly symmetrical and have twin beds and while not as enormous as the other two cabins they too have private bathrooms with separate shower cubicles. There are two sailors' cabins with independent entrances, in the extreme bows: one with a single bed, the other with bunk beds and shared bathroom. As befits a boat of this level, the owner can choose the wood, marble, soft furnishings, carpets and electrical appliances from a wide range offered by the boatyard for this Amer 86, as well as the optional accessories that can be added to the already rich standard ones. Permare: via del Castillo 17; Portosole; 18038 Sanremo (IM) Italy; tel. 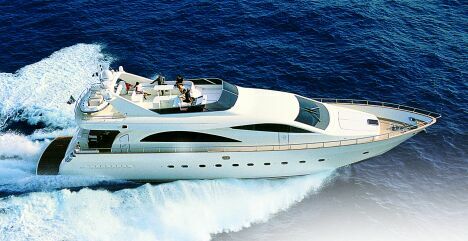 0184 504050; fax 0184 504052; e.mail permare@sistel.it; website www.gruppopermare.it.